It's important to assign a name to each workstation in your shop so that they can be easily identified on reports, workstation specific options can be configured, and you can correctly cash out your registers at the end of the day. 1. From the Ascend desktop select the View menu > Locations. 2. 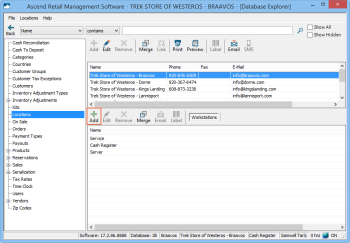 Highlight your location on the upper pane in Database Explorer. 3. From the lower pane, select the Add icon to create a new workstation for that location. 4. In the Name field, enter the desired workstation (such as Cash Station 4). 1. 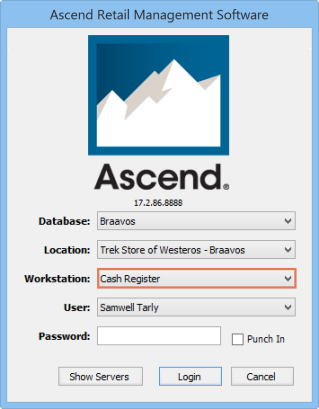 From the Ascend desktop select the File menu > Login. 2. From the workstation drop-down menu, select the new workstation name (such as Cash Station 4). 3. From the User drop-down menu, select your name. 4. In the Password field, enter your password. You can "lock" a computer, so that the workstation name cannot be changed. This is useful ensuring you get the right data in reports. 1. From the Ascend desktop click the Options icon. 2. Select General on the left. 3. 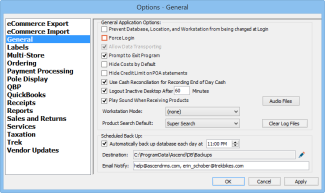 Check the box for Prevent Database, Location, and Workstation from being changed at Login.